Last week at Tapa's I had a plate of 'Mice' set out that I'd thrown together for the party, and they were a HIT!!! OK, so people liked them. 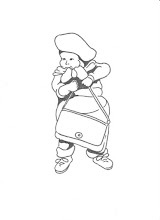 And one of our guests made them with her granddaughters and they took them to school. 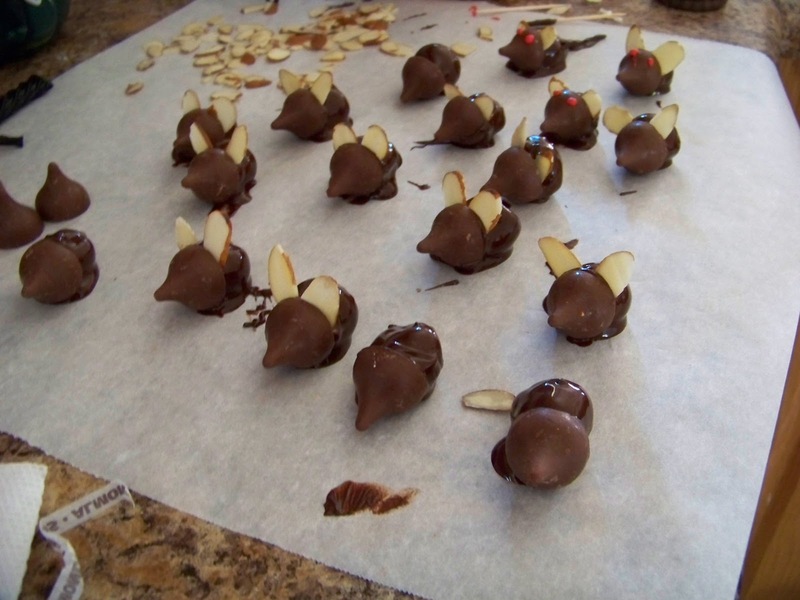 Well, I met the granddaughters and they were very polite when introduced to me, and then their grandma told them I was the person who'd told her how to make the Mice, and the girls got very enthusiastic. They had to tell me how much fun they'd had making them, and giving them away at school. Made me feel good. And these are as easy to make as can be. 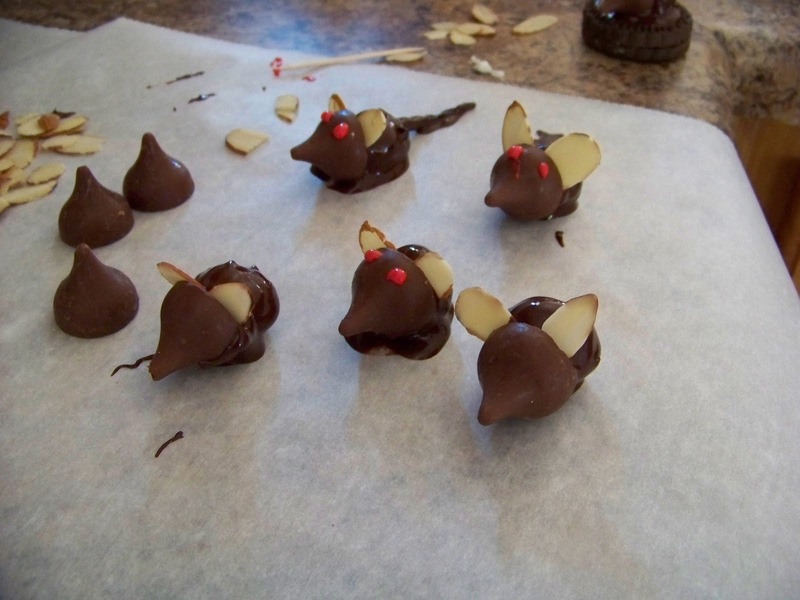 Five ingredients, a little time, and Voila, MICE, edible ones. Drain a jar of Maraschino Cherries, reserving the juice if you like. Rinse, then pat them dry on some paper towels. 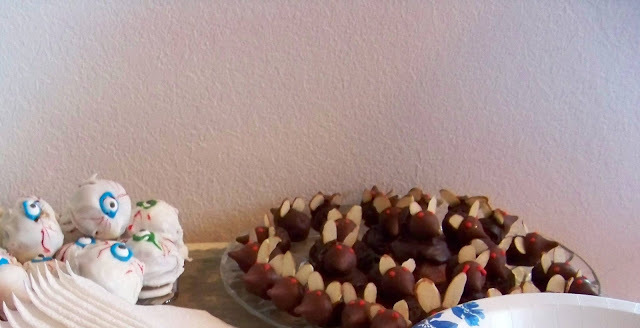 Melt chocolate, and let sit for a couple of minutes, while you're unwrapping the Hershey Kisses. 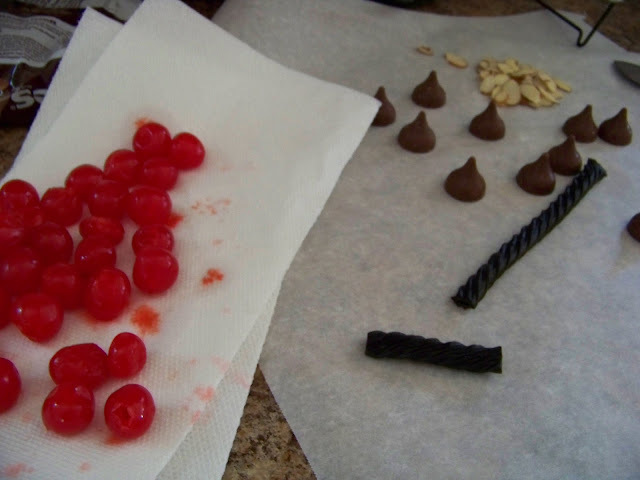 so that it adheres, then put two slices of the almonds in between the chocolate covered cherry and the Hershey Kiss. 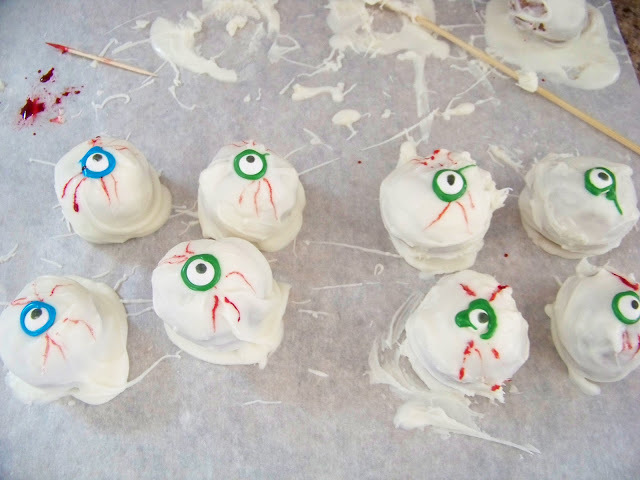 Make eyes with the red frosting tube and set aside to cool. (I forgot to take a good picture of my finished plate of mice, grrrrrr). Repeat til all the mice are assembled and set aside to solidify. Serve and enjoy. 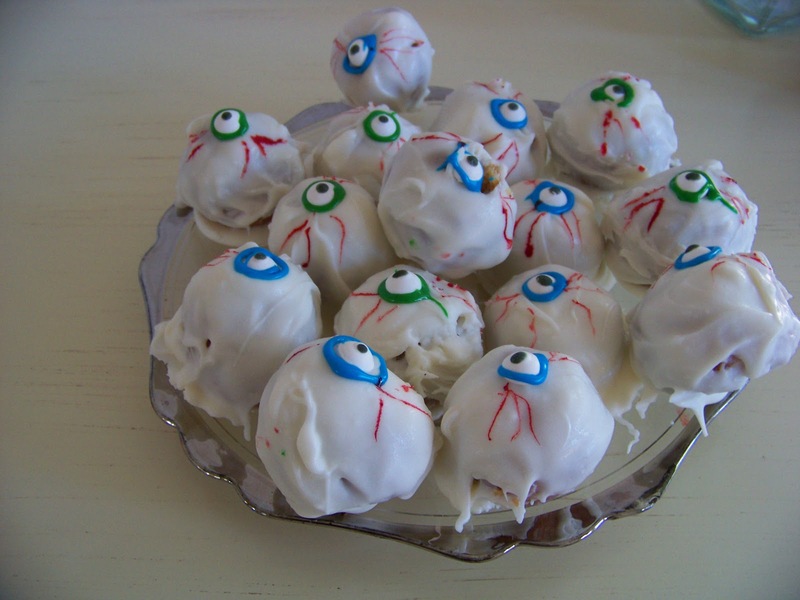 And as you can see I also made some 'Crunchy' Eyeballs as well. 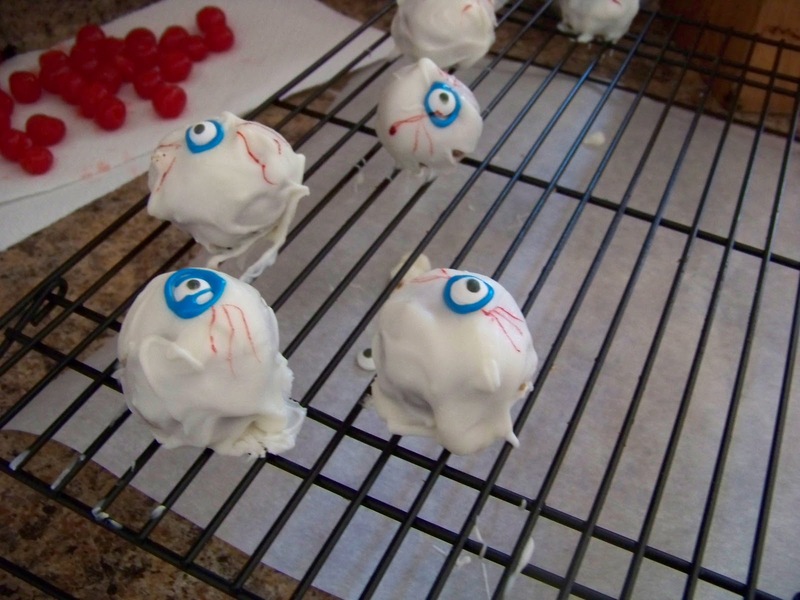 Believe it or not, they were a hit with the grown ups there as well. Again, something so easy to make and fun for the kid in all of us. Blue and Green frosting in a tube. 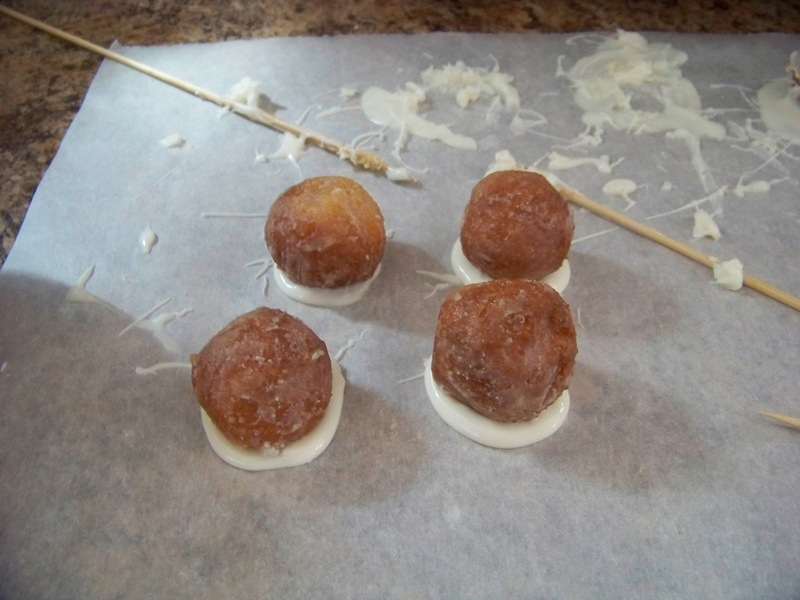 Drop a little white chocolate on a piece of parchment paper, then position the doughnut hole on it. 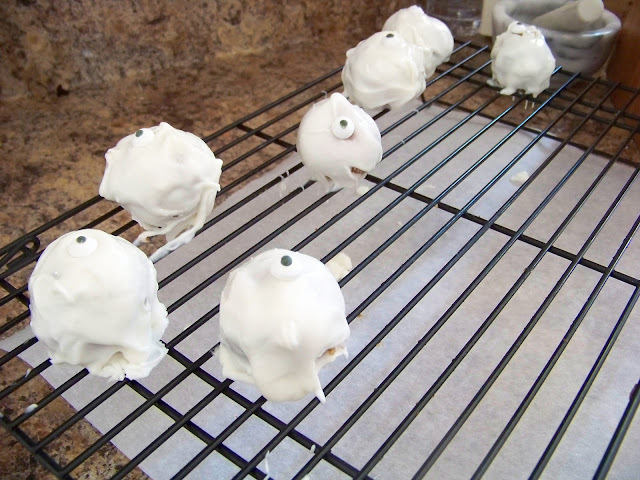 or you can also just dip the whole hole into the white chocolate. Piped some blue and green frosting around the eyeball, and then finished them up with some red food coloring applied with a toothpick, to make them suitably bloody. 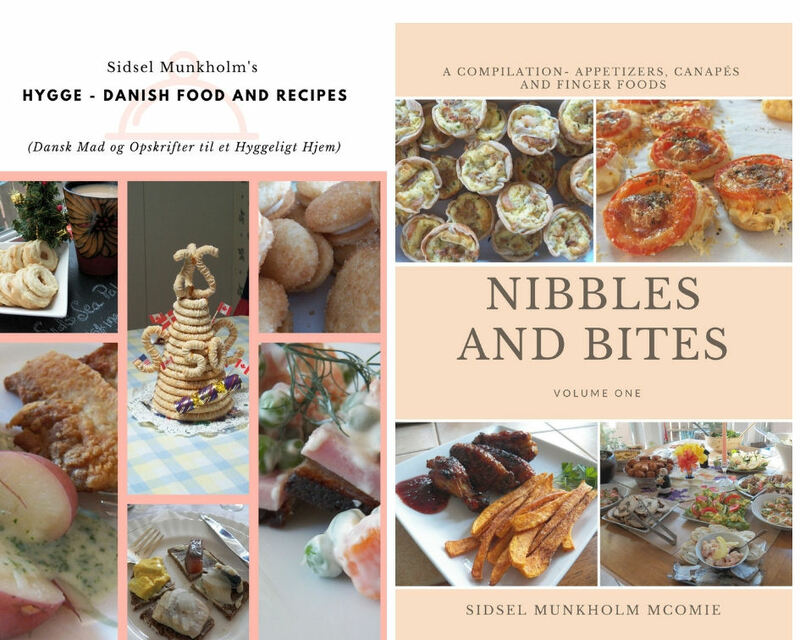 It's fun watching grownups playing with their food.